We are excited to announce that the countdown to the launch of Folgate Insurance has officially begun, and here is your first preview of what the brand will look like. 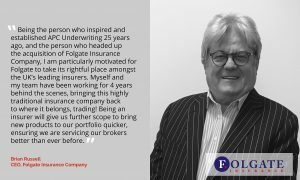 In just a matter of weeks APC Underwriting will be transforming into Folgate Insurance Company Ltd, continuing with it’s highly successful business model, whilst embracing Folgate’s traditional values. Scroll down to read our Frequently Asked Questions. Folgate is a UK Insurance company authorised by the Prudential Regulation Authority and regulated by the Financial Conduct Authority and the Prudential Regulation Authority under reference number 202146. We are delighted to confirm that we have received our first rating from A.M.Best of BB+ (Stable). This is a strong start for Folgate and we aim to strengthen this further in the near future. Our co-insurance partner; MS Amlin has an A.M best rating of A (Excellent). When will Folgate start writing business again? Business will be underwritten from Tuesday 1st January 2019. Will I need a new TOBA? There will be no requirement for a new TOBA. Will there be any changes to commission levels? There will be no changes to your existing commission arrangements including the option to Flex up or down as required. What if I have an existing policy and/or an upcoming renewal? Renewals will be offered in line with normal procedures during December 2018. Any policies due to be renewed from Tuesday 1st January 2019 onwards and any MTA’s for existing business, will also be underwritten in line with current procedures. How will I do business with Folgate? Other than binding authorities and exclusive schemes, APC’s current on-line trading platform will be re-branded as Folgate from the launch on 3rd December 2018. Your log in details will remain unchanged and it is business as usual on-line. Will there be any changes to payment procedures? All payments will continue to be made to and from APC Underwriting as the managing agent for Folgate. Will there be any changes to claims procedures? There are no changes to existing procedures and our in-house claims department remain in place to help you when a customer suffers a loss. Will there be any change in personnel or contact details? There will be no changes made to members of the team with contact telephone numbers and our postal address also remaining unchanged. With regard to email addresses, please be aware that any email sent by us from 3rd December will be from new Folgate email addresses. However, it is important for you to note that any correspondence sent to our existing email addresses will automatically be sent to your contact persons new Folgate email address and so there is nothing you need to do. What about APC London Market? APC London Market is an integral part of the APC group and we can confirm that it will be business as usual for APC London Market in the new year. Please visit www.apclm.com to find out more.